Note: There is a blogger problem with clicking for a full image today. You may not be able to get back to the blog, so copy URL and re paste if needed. This is the advisory I woke up to. Ice will be isolated, but I have to report it. As of 4am, I could not find any temperatures in the metro Baltimore area below freezing. At 6am, it was ranging from 31F to 34F in Central Baltimore County. Sure the first round of precip may drop the temp a degree or two from evaporational cooling, so there may be some 'isolated' icy spots, but today's problems will be to our north in central PA to NYC metro. Locally, between 31F and 35F, and any ice would be just during the morning ride - North of the beltway! However, wet roads, and ice build up on 'other stuff' is possible. Mainly the valleys hold on to the cold. The hills just warmer with tis set up. The Snow Poll has a few more hours, but I am surprised that most of you do not want to feed the sensational machine with early snow forecasts. A few hours left, but again I will act on the results. As we shift out attention to the weekend storm, here is the latest from the GFS model for Sunday. Honestly, with it's tendency to flip and flop, this is not too bad. It's back to where it was two days ago with a coastal Low off of the DE coast. This could be the perfect set up for the NW 'burbs and southern PA, but any fluctuation would prove a bust. There is so much to consider with this storm, first of which is the current storm passing through. That wraps ups off of the Canadian coast and sets up the cold block. 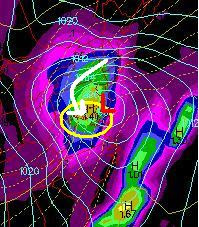 The exact position on Saturday of this block will determine how far south the cold air gets, and resulting path of the next storm. Here is the Canadian Model showing Saturday evening. 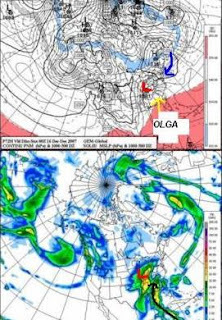 The High in Ontario is the result of that block, but also look at the intrusion of Olga from the Caribbean. That would not only inject tropical moisture, but warm air into the system. The Canadian's solution on Sunday is an initial Low in Ohio, occluding (closing off in late stage of development) and sending it's energy to a developing system overhead or just south. That's not good for snow, but ice or rain turn over. 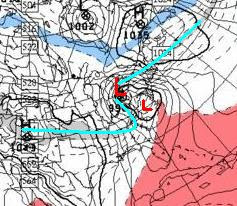 This Low is about 100 west of the GFS, and would make all the difference in how much we get. At this point, I can say that there will be enough moisture to result in 1-3 inches of liquid. But will that include ice, or snow? Then how much of each? Central PA/NY and New England a foot plus a good possibility. But for the big I-95 cities it is that classic meandering mix. Either way, it should end as snow as it pulls away from us on Sunday. Whatever happens Saturday night is still 'up in the air', but Sunday morning through mid day should be our snow time.